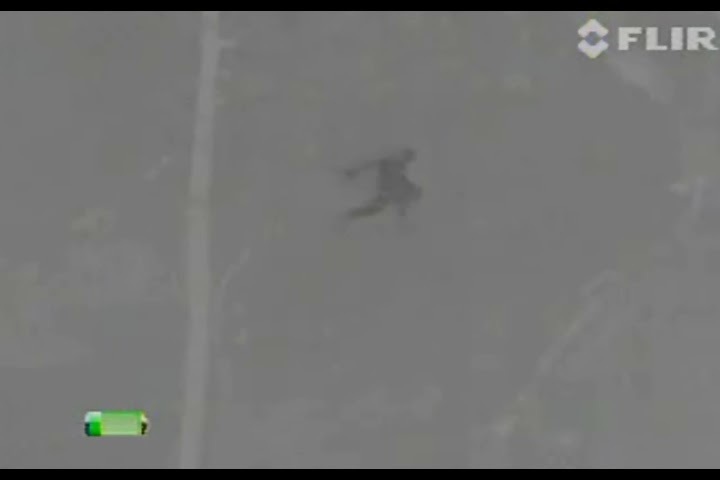 On January 23rd 2008 (exactly 6 years ago today), The Telegraph reported, "The photograph, taken in 2004 by the Mars explorer Spirit, appears to show a human shaped object that looks startlingly like previous photographs purporting to have captured Bigfoot." 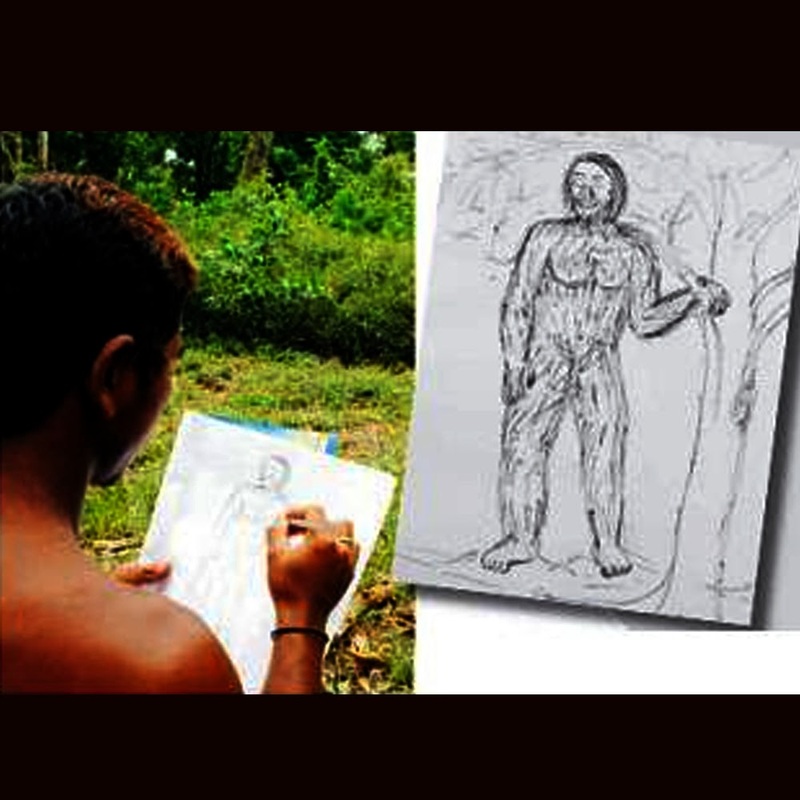 The comic Bigfoot: Sword of the Earthman explains how he got there. 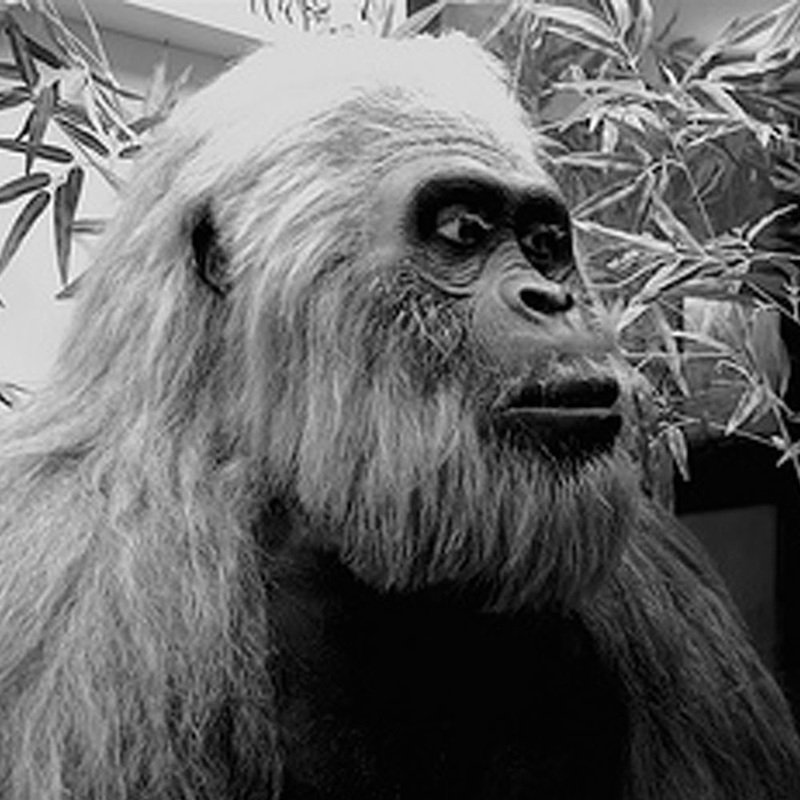 Deep into it's fifth issue, of a six-part series, Bigfoot: SOTE has been a media darling inside the world of independent publishers. 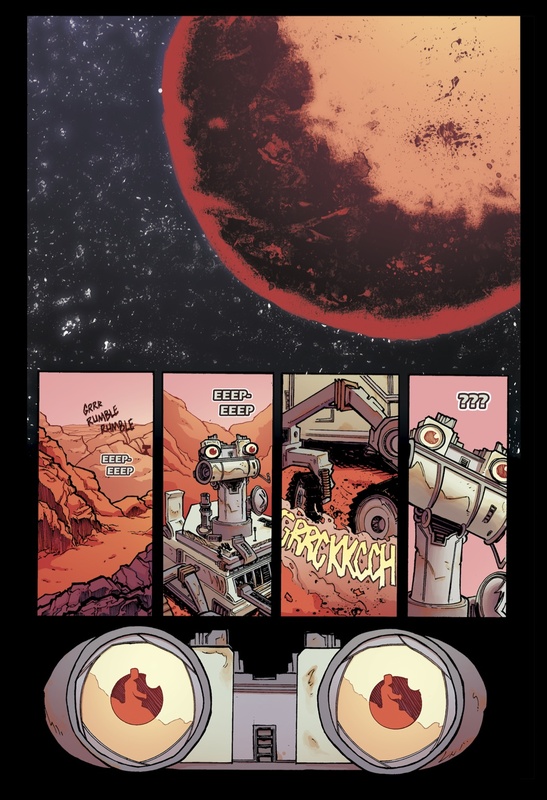 Creator, publisher and writer, Josh S. Henaman, describes the comic as, "Equal parts Conan and Flash Gordon." Filling out the creative team is Andy Taylor (line art) and Tamra Bonvillain (colorist) and boasts a logo design by Tim (Enormous) Daniel. We have read every issue so far and the series gets better and better with every installation.
! !SPECIAL OFFER!! ONE DAY ONLY!!! For one day only, every person who buys the "Bigfoot Bundle" (issues 2 - 5), Issue #1 will be included for FREE! Just type "I saw you on Mars!" in the comments when you order. CLICK TO BUY THE BUNDLE!!! and type, "I saw you on Mars!" in the comments to get Issue#1 for FREE! Bigfoot is no stranger to comics and if you are a real insider you will know that Bigfoot taught Superboy how to be a Superman back in 1977. In the same year an over sized Bigfoot named Yetigar fought Godzilla. 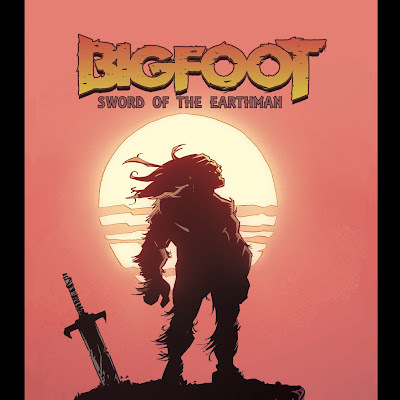 Bigfoot – Sword of the Earthman is available now in select stores and via its website. 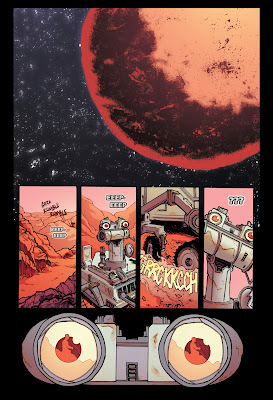 A four-page preview appears online at www.bigfootcomic.com. CLICK TO BUY THE BUNDLE!!! and type, "I saw you on Mars!" in the comments to get Issue#1 for FREE! 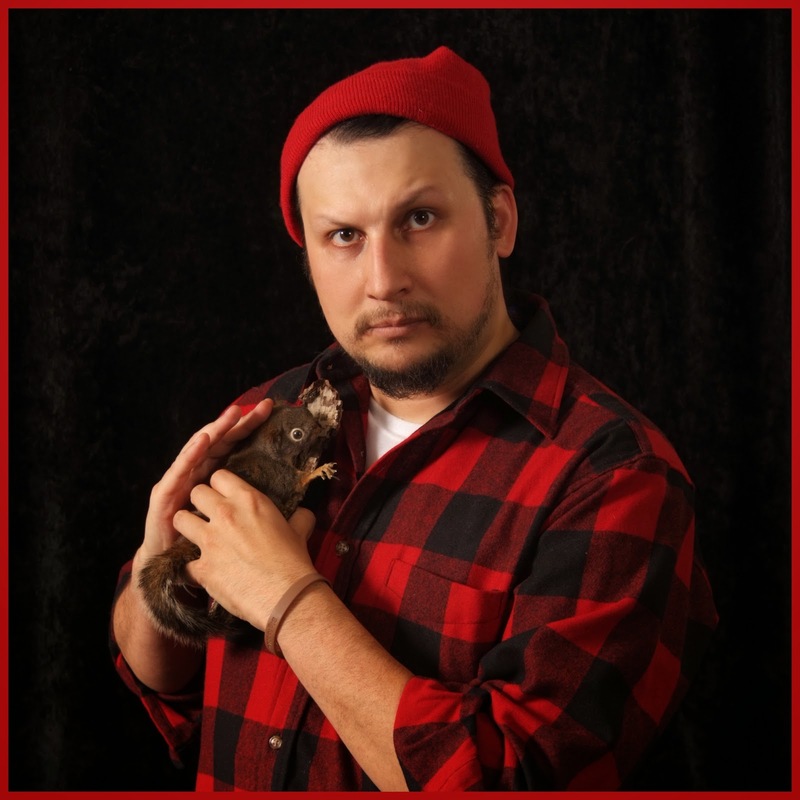 Brewhouse Comics is the ultimate DIY publishing house. Founded in 2012 by Josh S. Henaman, Brewhouse takes its name from the public houses of old, where the emphasis was on good drink, good company and great stories. Focusing on craft, Brewhouse aims to take that philosophy into the comic book world one story at a time. 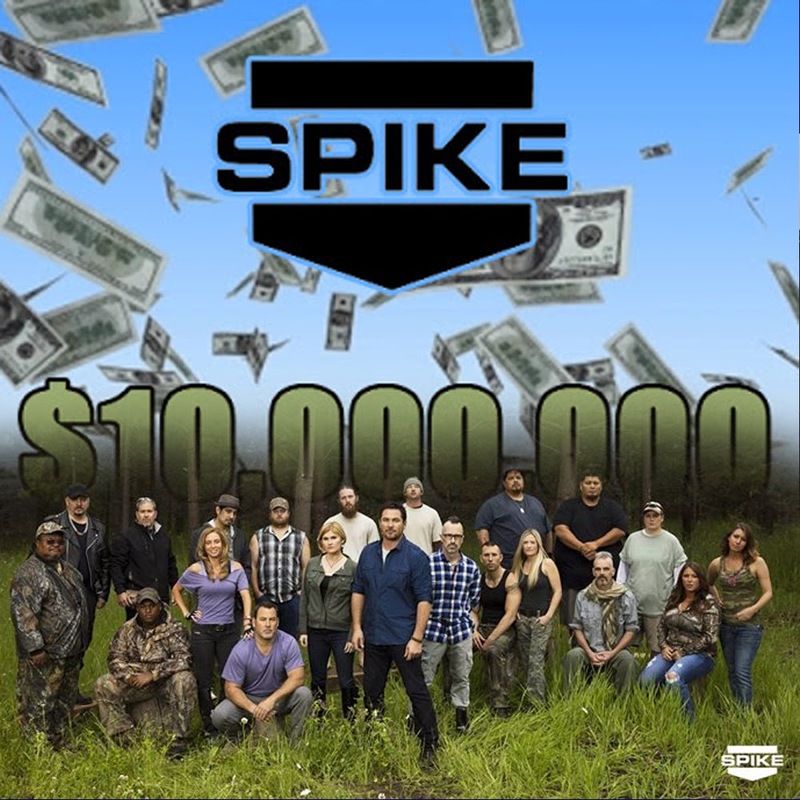 LAST CHANCE TO GET A PIECE OF BIGFOOT HISTORY CLICK TO BUY THE BUNDLE!!! and type, "I saw you on Mars!" in the comments to get Issue#1 for FREE! 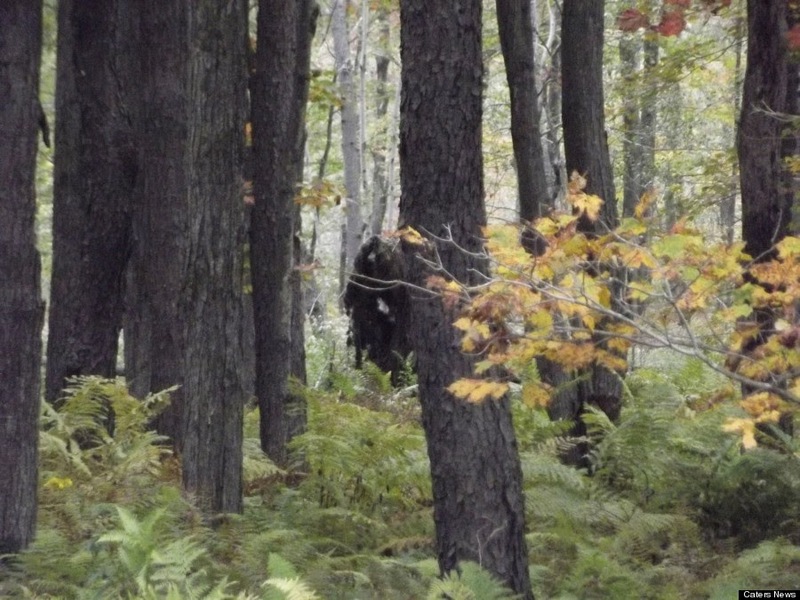 On May 29th, 2012, around 7:30 at night, Kate Murphy and her friend Diane saw an extremely large figure running through the woods. 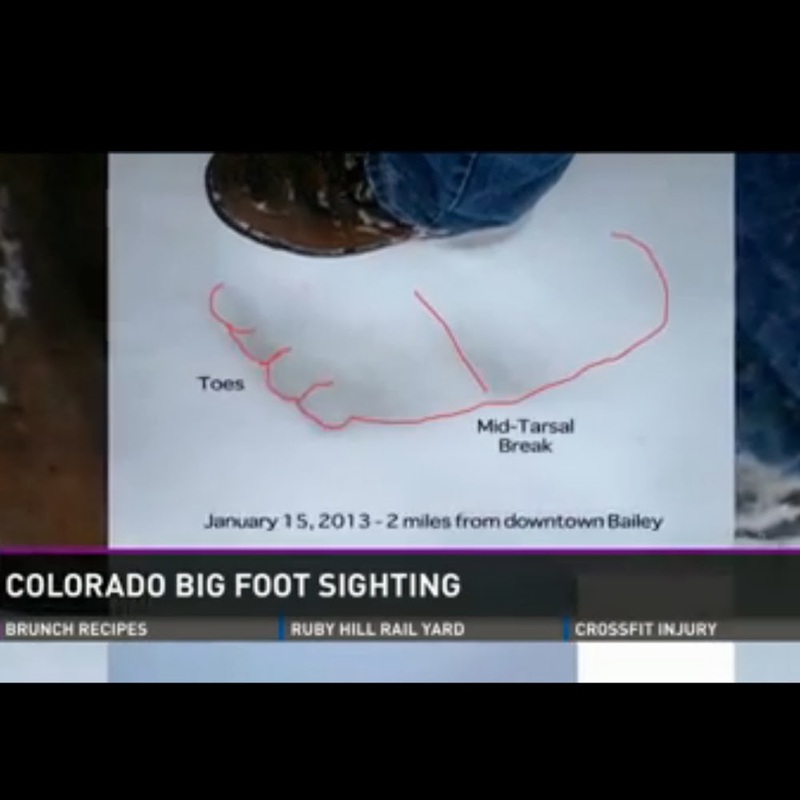 this all happened after they had decided to take an impromptu hike in Bailey Colorado. During the Hike they heard the snap of a large tree branch. 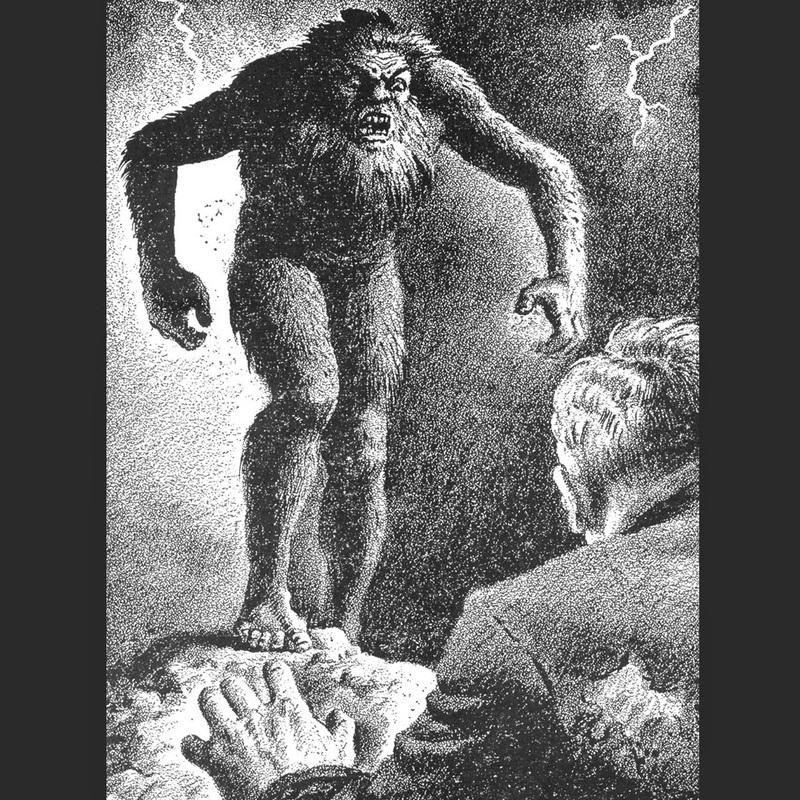 When they turned their heads towards the noise, they claim it was a huge creature with hairy long legs running with very long strides. 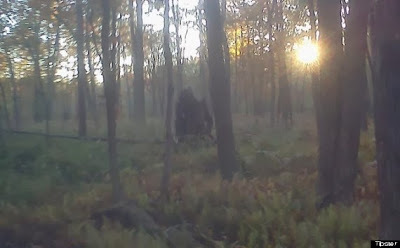 This encounter was investigated by the team at UFONUT.com. 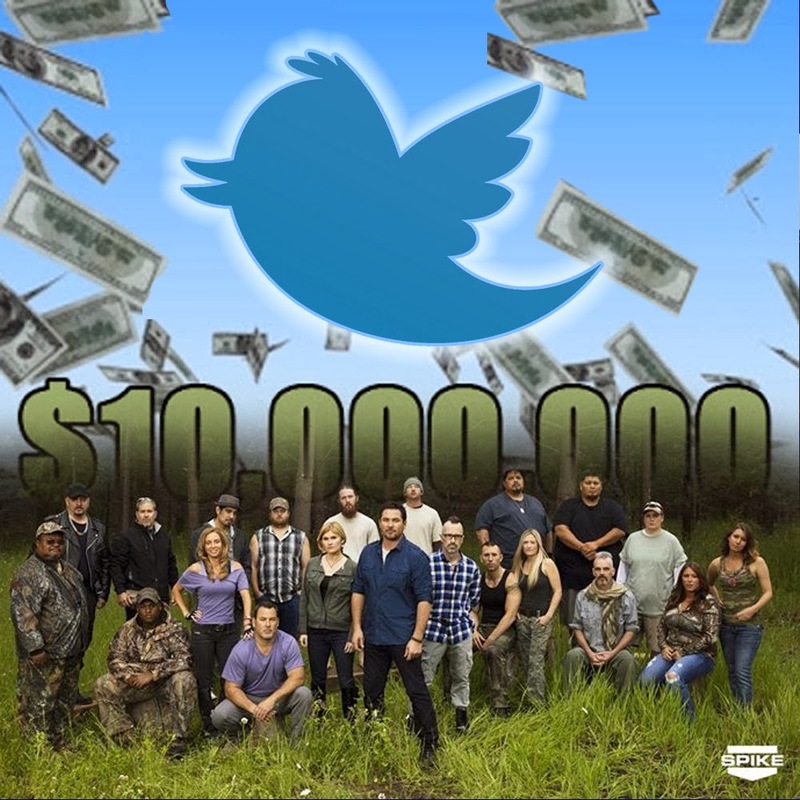 They have interviews with the Bailey Bigfoot witnesses and a follow up investigation to the Bailey Bigfoot encounters. 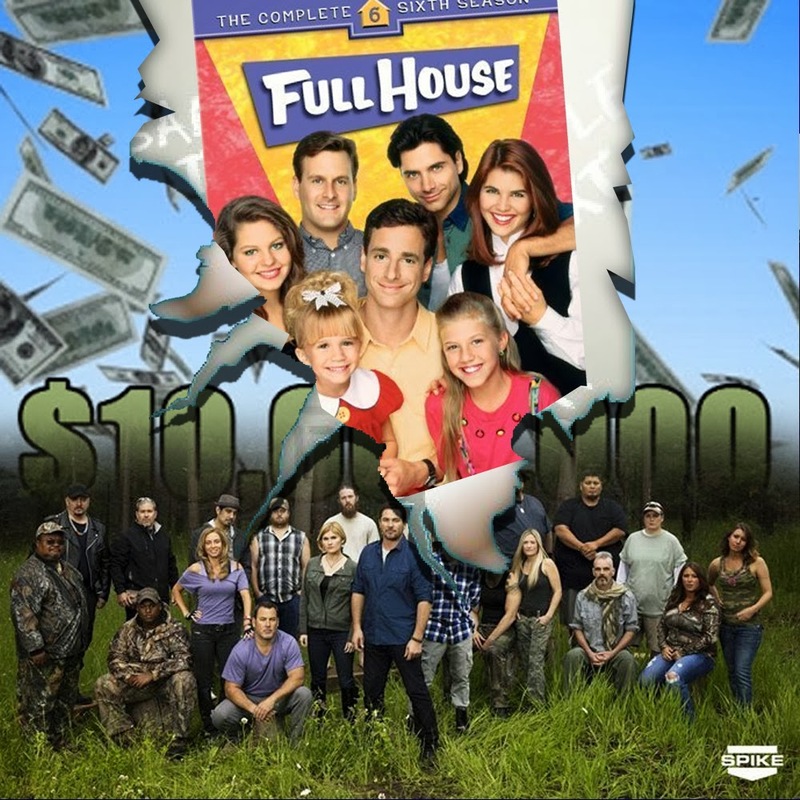 And, as promised, The UFONUT investigation. Thanks to a heads up from Cliff Barackman and a repost from Jerry Hein we were alerted to an iPhone case that converts your iPhone into a FLIR thermal imager. 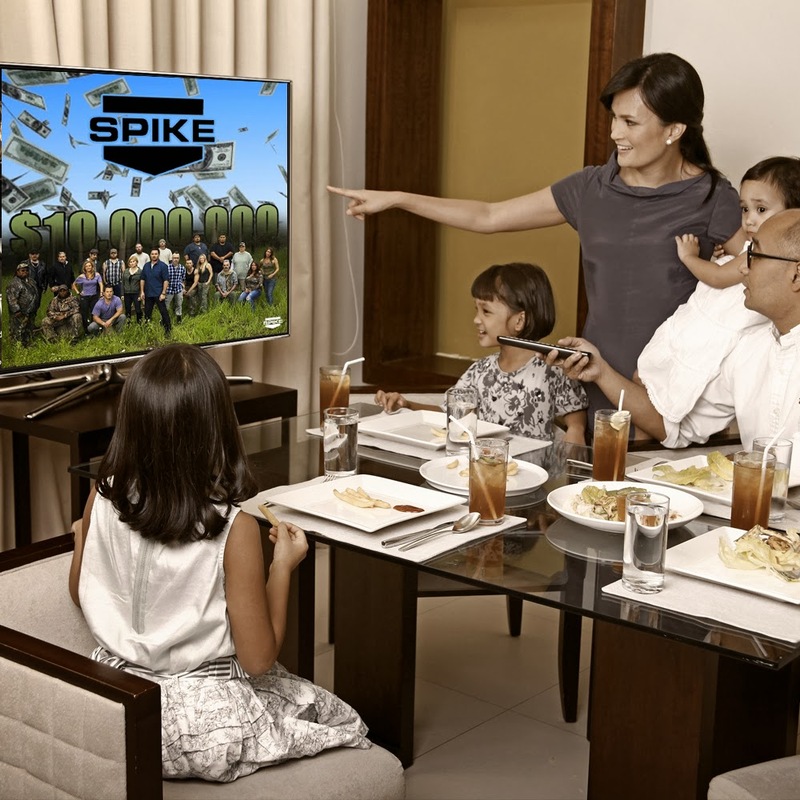 We scoured the net to get all the details and reactions. read below. This year FLIR has managed to shrink the same thermal imaging technology it sells to law enforcement and the military so that it fits inside an iPhone 5 case—letting us civilians share in the fun too. 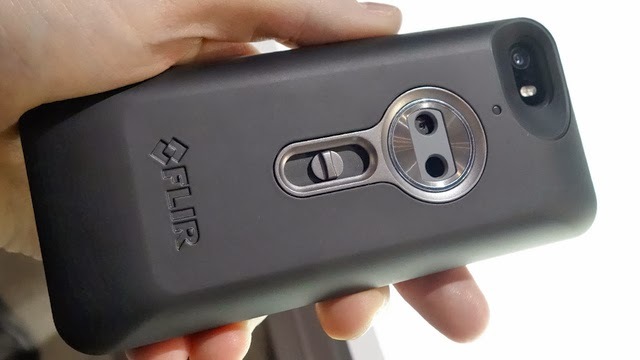 Available sometime in the late spring or early summer later this year, the FLIR thermal imaging smartphone case will initially be available for the iPhone 5 and 5S and will cost $350. 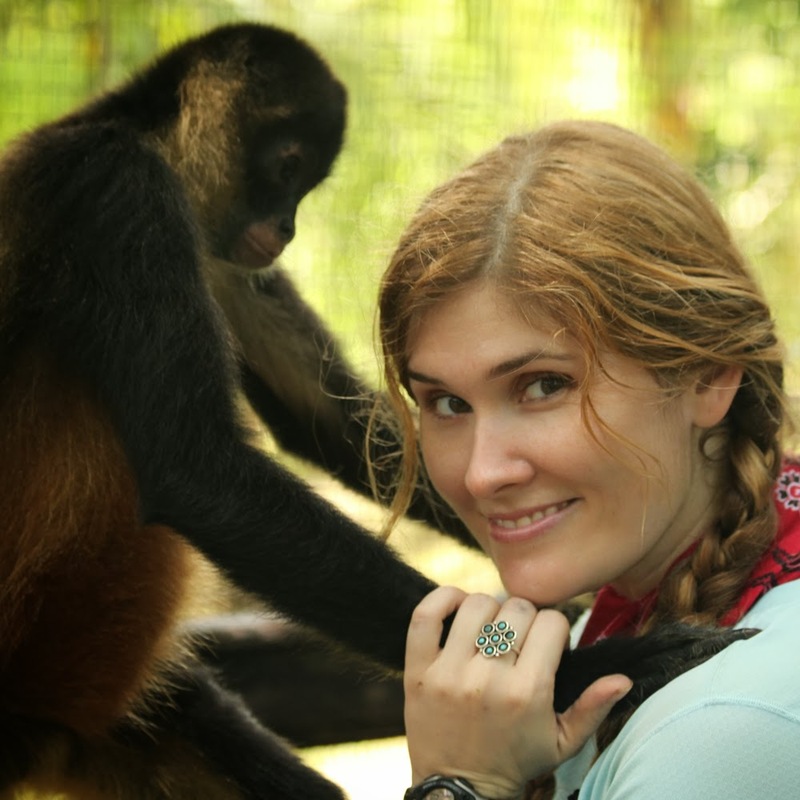 It features a built-in battery that will power the pair of cameras it relies on for up to two hours, and can also be used to charge your phone when you're not searching the forests for wild animals. Right off the bat, I can think of two types of people who might be interested in a $350 case that turns the iPhone camera into a thermal imaging camera: ghost hunters and home inspectors. And if you’re a home inspector who moonlights as a ghost hunter, well here’s your next purchase. While big-boy thermal imaging cameras can cost thousands, FLIR has shrewdly concluded that maybe not everybody has deep pockets and maybe having a pocketable thermal imaging camera with you at all times would be kind of cool. 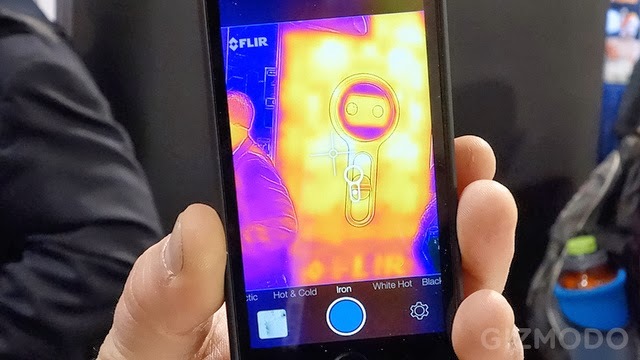 The FLIR One case leverages a special app to grab heat signatures and detect temperatures, and what you see on the screen can be captured as photos and video just like you’re using the iPhone’s built-in camera app. The case itself doesn’t add too, too much bulk considering the functionality it adds, and it doubles as a backup battery if your iPhone battery runs low. A FLIR rep told me the battery pack will last four hours for powering the thermal camera, or you can re-route the power to your iPhone instead. The FLIR ONE iPhone case significantly ups the imaging powers of your iPhone 5 or 5s, making it into a thermal imaging camera that lets you see heat signatures from either live people and animals from up to 100 meters away, or from environmental sources including heating ducts, wall gaps and more. 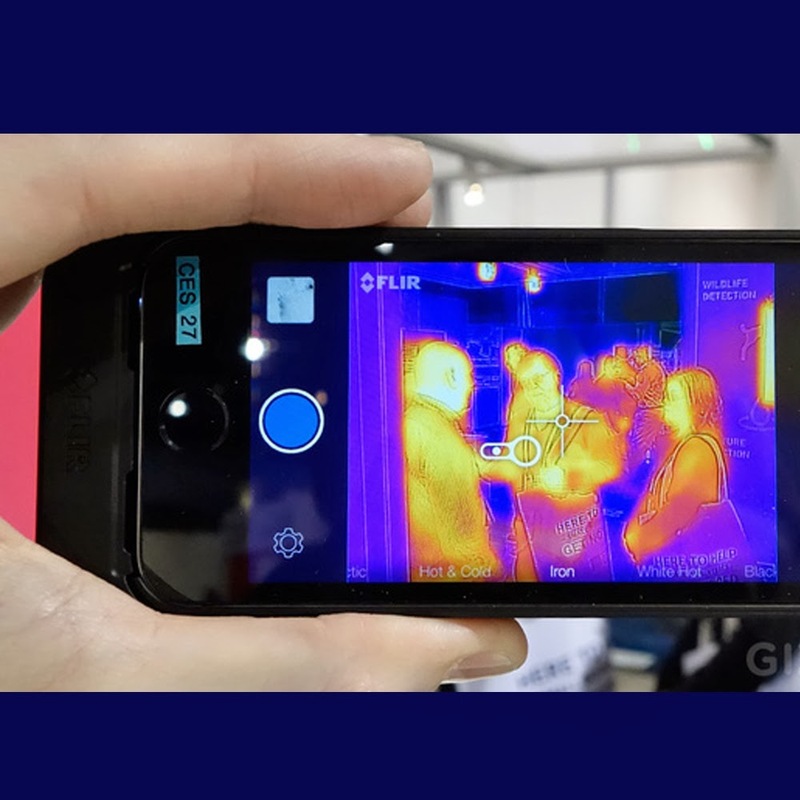 Most of FLIR’s products to date are aimed at hunters and professionals, but this iPhone case brings an affordable smartphone-based thermal camera to the masses for the first time, the company told me at CES. The FLIR is $350, which might seem steep for a case with a built-in camera, but it’s actually around $750 cheaper than their least expensive standalone model currently available, and it provides an easy-to-use interface that anyone could quickly learn. The app for the FLIR ONE offers numerous modes that interpret thermal data differently, with some showing many degrees of temperature, and others more clearly showing more or less binary differences between extreme heat, average temperature and extreme cold. Amazingly, it also picks up residual heat, like that left by a foot on a carpet for quite a while after a person was there. The new iPhone case is called the Flir One and it is designed for the iPhone 5 or 5S. 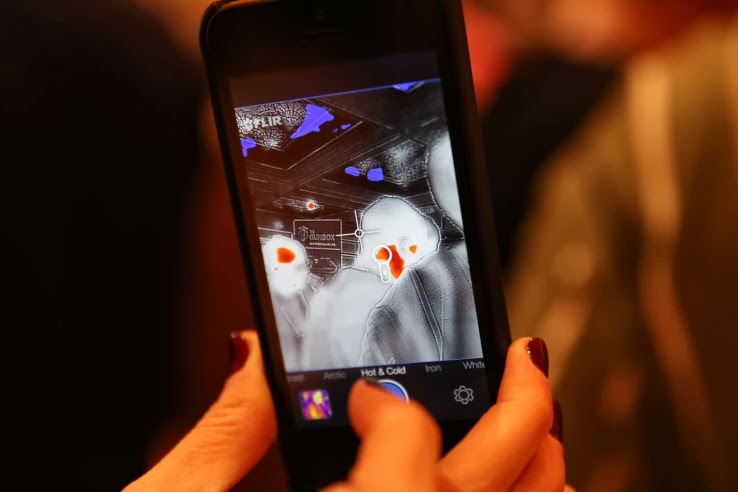 With the case attached to the smartphone, the iPhone becomes a thermal imaging camera. The Flir One case allows you to see the heat signatures of people and animals from up to 100 meters away. The camera will also show heat from things inside walls like heat ducts and gaps in a wall. The Flir One case is $350 making it much cheaper than the next cheapest thermal camera on the market. 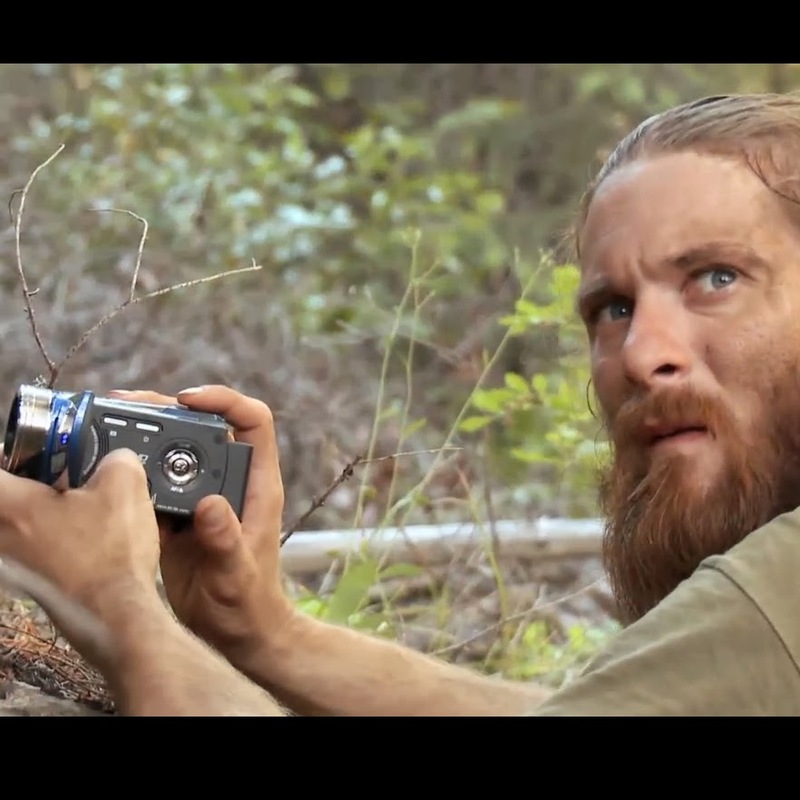 The camera sounds like some sort of tool out of science fiction. It is said to be capable of picking up the heat left behind by a person on the floor after they walk by. Potential uses for the Flir One case include finding thermal leaks in your home or water leaks behind walls among other things. I could see this device being useful for hunters as well. The annual release of Sierra Nevada's classic Bigfoot Barleywine is upon us, and The White Owl Social Club wants to kick off its release the right way. 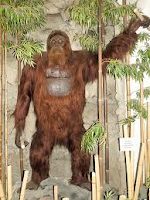 More than simply a 2014 Bigfoot release party, the White Owl has taken the theme to the next level by inviting Bigfoot investigators to give presentations on Bigfoot studies, theories, history, and background information, all from true experts. Beer lovers will be happy to know that there will be even more special beers and vintages on tap for this very unique event on Thursday, January 16th. Guy Edwards of the local group Bigfoot Lunch Club, which hosts a monthly “Bigfoot and beer” meeting called HopsSquatch. 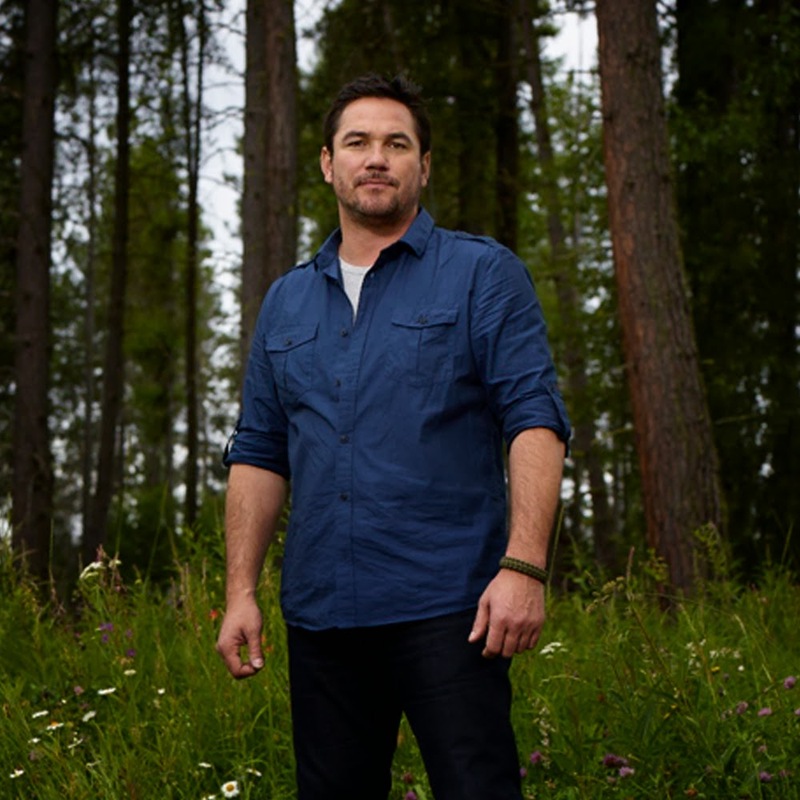 Guy Edwards will give us a short video presentation detailing the various forms of Bigfoot. 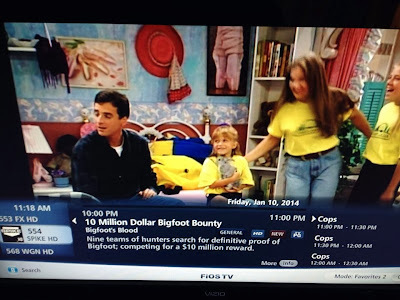 Our next guest will be acclaimed Bigfoot analyst Rhettman A. Mullis, Jr., (MS, PhD-ABD, CAF, MHP). Mullis is best known as a spokesperson and founder of the Washington-based group Bigfootology, which comprises a team of scientists who analyze Bigfoot phenomena and evidence, as well as advise in and conduct field research. 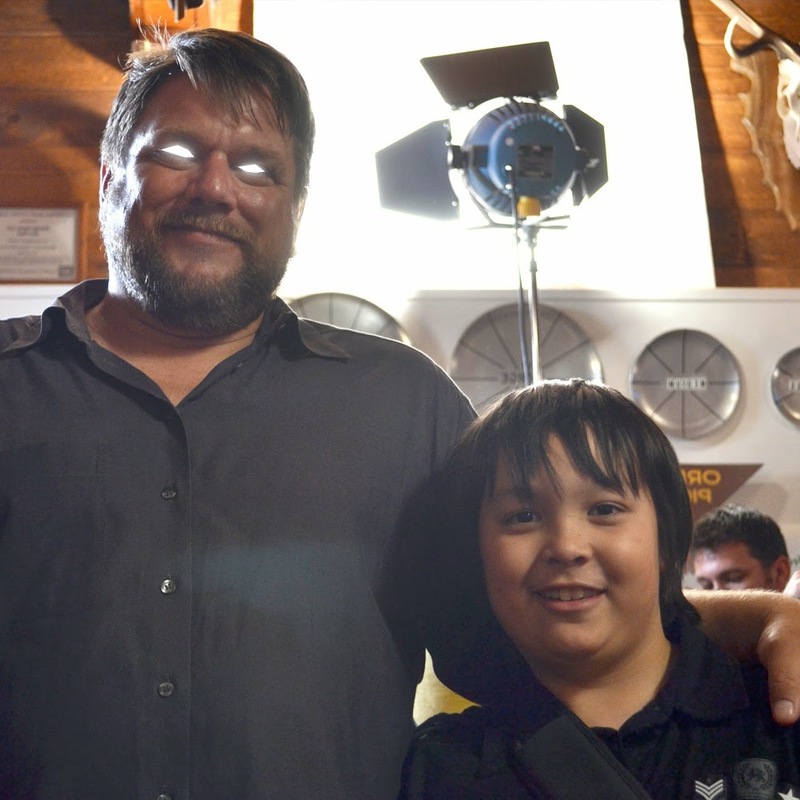 Mullis is also a well known frequent guest on the wildly popular talk radio show “Coast To Coast AM”, a long running and nationally syndicated (1190 AM in Portland, OR every night at 10:00pm) program for all things paranormal. Mullis is taking his personal time to drive down here from Bellevue, Washington on a weeknight to speak at this event. 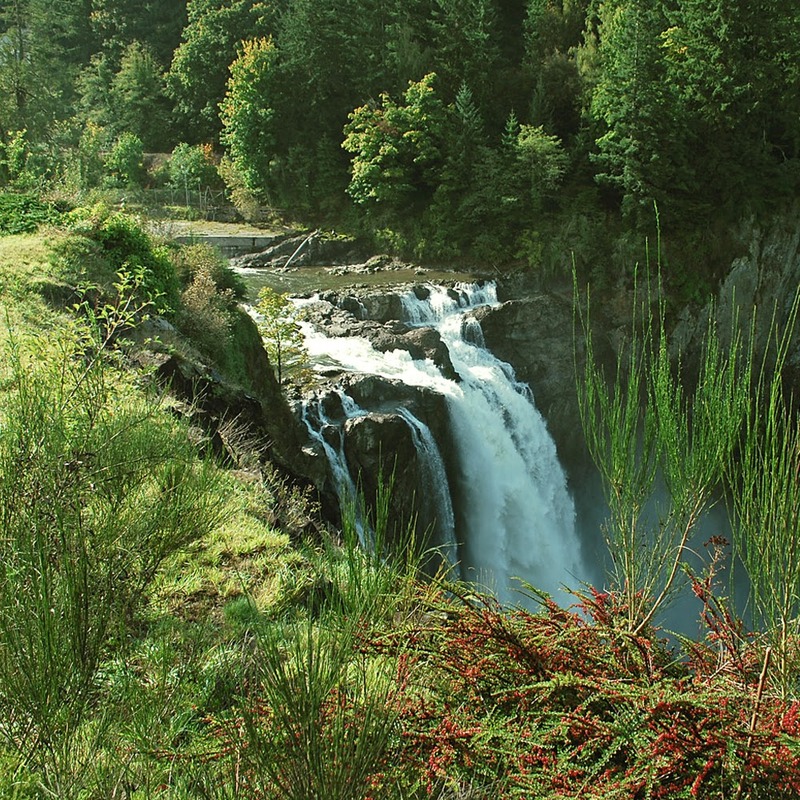 There will be a break in between both speakers, allowing plenty of downtime to enjoy the brews and mingle as well as a raffle with Sierra Nevada prizes. Obviously hoaxes are frowned upon, but how this single picture was able to fool the media twice is fascinating and almost unbelievable! We dig deep in this investigative report to prove Bigfoot was not found in Scotland. On December 29th 2013 a man named Garry Mcteague uploaded a photo to the open Facebook group North Muirton Community Council. Along with the photo he wrote, "My dog that's usually timid starting going mental. I spotted this before 'it' ran off. I was crapping myself...but managed to grab a quick snap on my phone." 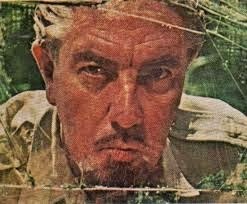 Two days later, on the 31st, TheCourier.co.uk ran the story with the photo. 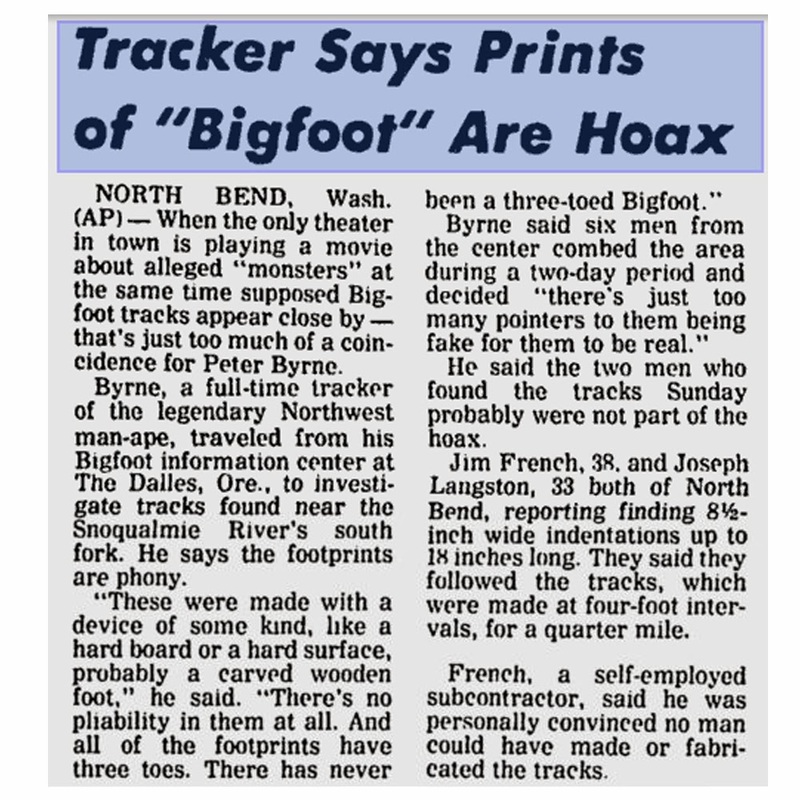 In two more days the Huffington Post UK would rerun the same story under the headline, "Bigfoot Found In Scotland? Dog Walker Snaps 'Sinister Figure'"
The irony is Huffington Post already ran a story with the same photo back in October 3rd 2013, under the headline, "TWO Bigfoots? Hiker Shoots Clear Photos Of 'Moving Beasts' In Pennsylvania" See the photos below. This is the same photo that ran in both stories. Huffington Post wrote, "Pennsylvania hiker John Stoneman says he was driving his car through Kinzua State Park when he noticed not one, but two hulking creatures lurking in the woods. 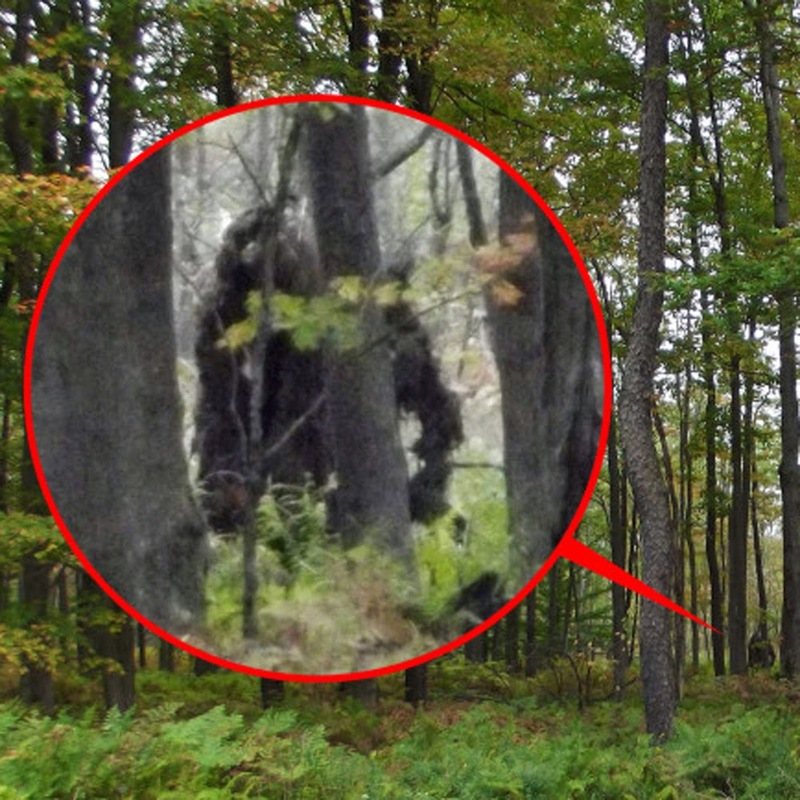 He slowed down and took the photographs, which do indeed appear to show at least one giant apelike creature behind some trees. He told the HNGN, 'I'm a skeptic myself. I'm not a believer, but this was not a bear and you can see fur on it ... 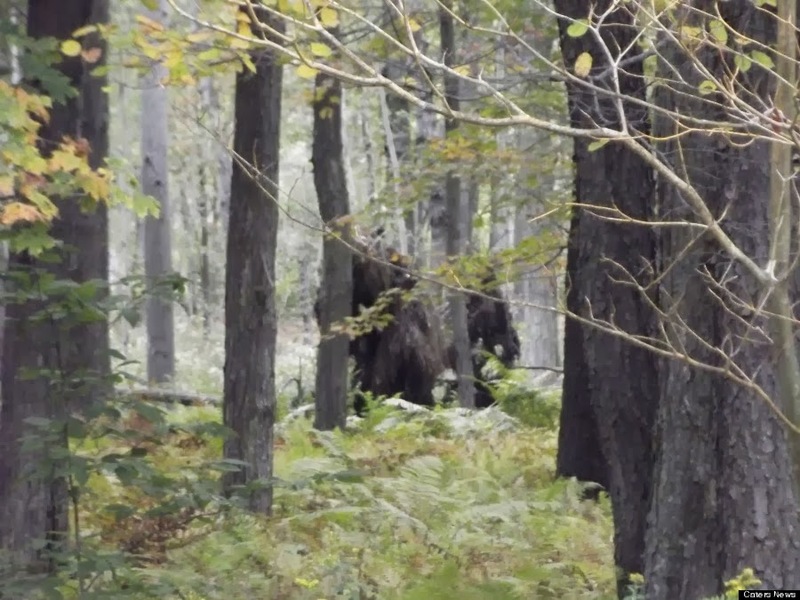 It's wider at the shoulders and tapers down whereas a bear is bigger in the middle and stands differently with its paws out -- this was standing like a man, like a Bigfoot.'" WAIT! It gets better. Three days on October 6th 2013 later Huffington Post reveals the Bigfoot photos are a HOAX! 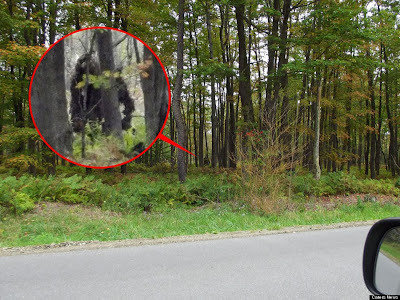 A new article publishes photos of the "Bigfoot" from the same angle but up close revealing it is a tree stump and nothing more. See the photos below.